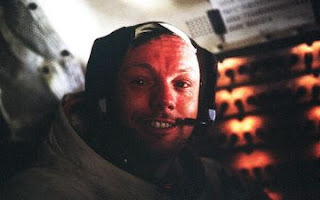 As you may have heard, Neil Armstrong, the astronaut who first set foot on a landmass other than our planet, has passed away at 82. He and the Apoll 11 team were an inspiration for many, including me. For years as a young kid, I imagined being an astronaut until medical reasons dictated that being a pilot was forever out of reach (another reason why I turned to writing). I never stopped dreaming, however. In honor of this modern pioneer, I salute you, Mr. Armstrong. You might of had a small step, but it launched a giant leap for mankind. World, let's resolve our squabblings to make the next leap possible. I'm David, and may we never stop dreaming - you're next, Mars! I was so sad to hear that he passed away! What a man he was. Very sad! He was quite the humble person as well. He was a great man. I guess it's a reminder to us all that space exploration is one of the greatest achievements of mankind. What a legend! No one will ever forget this man. Indeed a legend and an inspiration. Neil Armstrong has taken a step to his next great adventure. He accomplished a great feat, the whole team rather. And his memory will live on. I'm still jealous of the man. I wish we could all get to the moon in my lifetime. What a moment for the world and the USA on the day of those first steps on the moon. I guess it was night, not day. What an incredible man. Even if you didn't dream of becoming an astronaut he was certainly a role model for those with big dreams. The world lost a good one. SO sad. What an incredible man. Nice tribute, David. Can you imagine what it must have been like? To see earth from such a new perspective. To be part of that first giant step! I wonder if he can see the moon from where he is now? He truly was a legend. I still can't believe that happened, even though it was before I was born. What a legend though... Hey, how much time do you put into thinking of that final line every blog post? They're always so awesome.